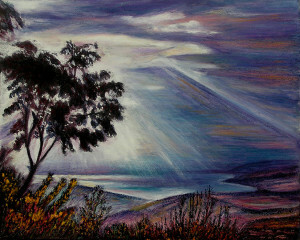 Sara M. Novenson is a Contemporary Jewish Artist, specializing in Judiac art and colorful New Mexico landscapes. Her studio and gallery is located on historic Canyon Road in Santa Fe, New Mexico. Her book, Illuminated Visions, Women of the Bible, now in its Third edition, is available here on her website. Sara is available as a speaker regarding her book, Great Women of the Bible and for her fascinating story telling on this and other subjects of Judaic Art. She has been applauded as a guest speaker at workshops and spiritual gatherings for members of all faiths. Sara Novenson’s art work has been exhibited extensively over the past 20 years in galleries, museums and numerous one woman shows. Three years ago her work was exhibited in solo shows in Zurich and Basel Switzerland. The following year Sara’s work traveled to her One Woman show at the grand opening of a the new Cultural Center in Bad Muenstereifel (near Cologne) Germany. Novenson’s work has appeared on the cover of many publications, most recently American Psychologist. It has been used by UNICEF and in books, calendars and magazines. Last year Hannah from her Women of the Bible series has been published nationally in Israel in a middle school text book. In 1994 she was a recipient of a grant to revive the tradition of Jewish folk art through teaching workshops nationwide. Novenson is in great demand as a speaker and lecturer on the subject of her Women of the Bible series and Jewish folk Art. She has lectured and taught in synagogues, churches, museums and organizations throughout the US and Europe. The Invisible Hand Brings Me Full Circle. Many times I have been asked to speak about my art, my inspiration. How does my religion affect my art and my art affect my religion? At this point in my life the two are inseparable. This wasn’t always the case. Spiritual I have always been, being born Jewish was not a choice. I fled from the “religious” upbringing and legacy handed down to me by my parents and ancestors. It wasn’t until I married a Catholic Italian and moved to Germany in the 80’s that I became Jewish again. To me painting has always been like prayer. Whether I’m painting the landscape, a flower, or one of my women of the Bible, I feel as though I am part of the earth, part of something much bigger than myself. It is a prayer of giving thanks, an expression of gratitude for the beauty of nature and all aspects of our life. As I paint outdoors, where I live in New Mexico, everything seems alive with spirit, the mountains, the trees, the rivers all have their own spirit and sense of being. As I work I often think of the native Americans, they too believe that everything is infused with life. Whenever I’m in nature, or in my studio painting, I feel most connected to spirit. I believe that connection is what drove me into painting. I have to express my gratitude, It has to flow though me somehow. While I was living in Germany something different began to flow through me. Something else that had to be expressed. It was love. The hidden love for my culture and ancestors emerged. I had to honor them somehow. How can I express the void left by a thriving culture that was once here and is now gone? I was haunted by this. Many strange coincidences and occurrences drove me to express these feelings through a body of work. Clearly an “invisible hand” was guiding me to fill this void. I began incorporating symbols from Jewish folk art into my work. This movement was practically wiped out with the Holocaust. Despite my Jewish upbringing and experience in America, I had never known it existed. The work was well received and extensively published on my return to New York. Over the years it has evolved and merged with my love of nature and the landscape. I created a series of landscapes framed by the beautiful Hebrew psalms, expressing thanks for the beauty of the earth which is what I feel as I paint. To make peace with my patriarchal upbringing I have created a series of Women of the Bible. I studied the stories of the women with a great female scholar, well versed in the Torah and the mysticism of the Jewish religion. It has all come full circle. Living in Germany brought me back to my Jewish roots, to feeling what it is to be Jewish, to learning about my religion in an integrated spiritual way. And now the work itself is coming back to Germany. I feel it is a kind of healing. In a way it is filling a tiny drop of the void. There is a silent spiritual presence behind it, a knowingness and a reason for the work to have happened. Copyright © 2004-2019 Sara M. Novenson, Contemporary Jewish Artist. All rights reserved.